Born in El Masnou (Maresme) near Barcelona April 18, 1867. Very quick he oriented his activity toward the choir song and very young – to the seventeen years – (year 1883), hi is already conductor of the Chorus the “La Lira de Sant Cugat del Vallès”, complementing this work with daily interpretations in the Cafè Inglés of Barcelona, first as pianist and later as member of a trio with Josep Badia (violin), Lluís Pamies (harmonium) and himself at the piano. A year late he change to the Cafè Pelayo where he interprets the piano in a quartet formed by Ernesto Cioffi (violin), Josep Soler (violoncello), Lluís Pamies (harmonium). The Cafe Pelayo, as the “Els quatre gats” (other cafe with an active promotion of Art Nouveau ideas), was a very active intellectual meeting place, grouping a lot of famous artists of that time as: Àngel Guimerà, Pere Aldavert, Narcís Oller, Antoni Gaudí, Lluís Domènech i Montaner, Emili Vilanova, Carles Pirozzini, Serafí Pitarra, Josep Feliu i Codina, Joaquim Rubió i Ors and others. At his twenty years, Millet had two basic interests, to got a solid musical training and the practice of his musical knowledge’s. 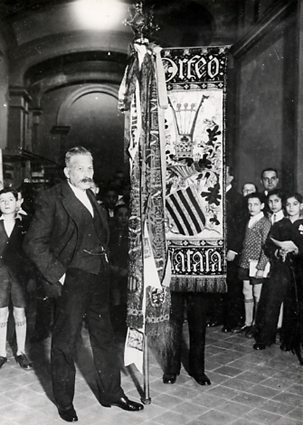 His vocation was developed simultaneously with the strong Catalanist impulse, together with the Art Nouveau Lluís Millet with the Orfeó Català banner development into the Catalonian culture. The next year, 1897, he created the “Capella de Sant Felip Neri” (Saint Philip Neri Chapel) in Barcelona of who he is named conductor. In 1904 he created the the “Revista Musical Catalana – Butlletí de l’Orfeó Català” (Catalan musical magazine – Orfeó Català Bulletin), published until 1936, with a total of 390 numbers. That date represents a break for the Catalan culture, duly to the Spanish civil war and the political subsequent circumstances, prosecuted for a long time. The publication of that magazine will not be restarted until 1984. Other activity actively promoted by Lluís Millet were the “Festes de la Música Catalana” (Catalan Music Festivals), started in 1904, with a total of nine festivals, until the year 1921. Although his work as composer is not very dilated, it is composed by a considerable quantity of pieces, compositions or harmonisations of popular songs, – many of which choirs – that have been popularized extraordinarily and nowadays are part of the popular Catalan music. Millet is an example of musical nationalism, evident in works as “El Cant de la Senyera” (The song in homage of the Catalonian national flag). “El Cant de la Senyera” (The Senyera -Catalan flag- song), as a representation of the identity. “Els Xiquets de Valls” by Clavé, as a representation of the origins. “La Mare de Déu” (The mother of God) of Nicolau, representing the present (1908). “The Alleluia” by Händel, representing the universality. “Els Segadors” (The Catalan hymn), as an element of national reaffirmation. Millet was also the author of various writings on musical themes as articles in the Revista Musical Catalana, “El cant popular religiós” (The religious popular song – 1912), “De la cançó popular catalana” (On the popular Catalan song – 1917). His basic literary production was compiled the year 1917 in a book titled “Pel nostre ideal” (For our ideal). Millet is dead the 7 December 1941 at 74 years.